iPhone glass protection. Do they work? Discussion in 'Mobile Phones / Entertainment' started by Mike Frezon, Aug 11, 2016. So my iPhone 6 fell out of my shirt pocket the other day and the glass cracked. About a month ago, my wife dropped her phone and practically shattered the glass. Both phones were taken to my local Apple Store. Each was repaired for $109 + tax (in a two hour window). No real complaints about any of this as my family has gone YEARS without any such problems. But with the two incidents coming back-to-back I am having a ton of people tell me that I should buy some type of screen protection--such as Z Glass--to help prevent glass breakage. 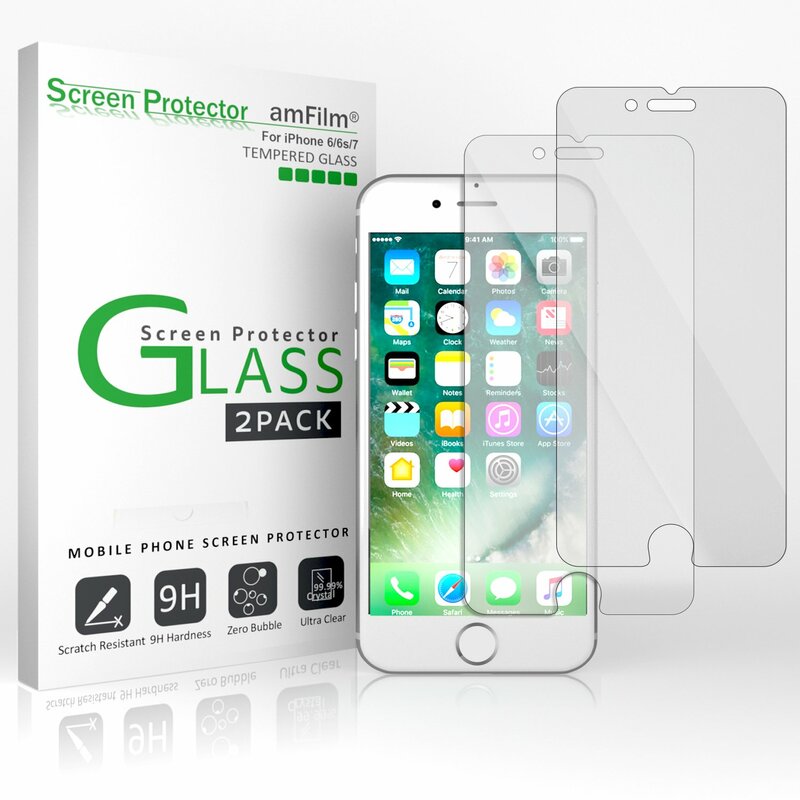 Do these various clear plastic screen films actually provide protection? Did it fall out of your pocket from the weight of all those unread emails? DavidJ, Clinton McClure, DaveF and 1 other person like this. I have found that those plastic sheets do nothing but make the touch screen harder to push. What has really worked for me is the rubberized case that my iPhone pops into. I don't want to jinks it now, but I have had my phone drop a number of times -- sometimes with a loud bang, and the glass has never broken. The case protects the back, but also has a bit of a ridge around the front so even face down it does not touch the surface. Or...as she just explained to me: "I have a lot of friends!!" "I just don't read all their e-mails!!!" Yeah, we both have cases on our phones. And I think they have done a pretty good job at keeping our screens/phones safe. It's just a strange coincidence that we both cracked our screen about a month apart after years of unbroken glass. The other things those cases do is protect the lens of the camera (which protrudes from the back of the iPhone case). You really need that bit of thickness to keep the lens from getting scratched every time you lay the phone on a surface. I'm just curious about people's experiences with those display protectors. I use the rubber case around mine and a zagg glass screen protector. Dropped mine last month and it cracked the screen protector, I thought it was my screen. So just pulled off old put on new. First time that's ever happened, Glad I had it on there. Zagg offers free replacements too just 6.00 shipping. Its not an ipod but I've had a Screenguardz on my Note 5 for over a year and all its suffered is some light scratching. $40 for a good protector and $6 if it cracks. My friend has an iPhone 6 that had a cracked (glass) screen protector that cost him $45. A few weeks ago we were browsing around in a Dollar Store in Derby, CT. Believe it or not, they had glass screen protectors for the iPhone 6 for $1. I removed the cracked one and replaced it with the $1. Dollar Store one. Fit perfectly. Still can't believe it. What a deal! So, in your friend's case, the glass protector really did the job and saved his screen. Much like larrdog's story above. I think I should really give these a serious look. I haven't taken any action yet. But, unfortunately, I never took the bull by the horns and actually installed them. I guess that's an important part of the process. And, you guessed it! My wife dropped her phone again the other day and shattered the glass...again. Another repair at the Apple store. The price has also gone up (to $129, I think). So the protectors are now assuredly installed on both our phones and I will report back with any further updates--as events warrant. phone multiple times it never has broken. I forget where she dropped it the first time. But the second time was on a hard floor at the mall (the same mall which contains our local Apple store!). She drops it ALL the time (sometimes even outside on pavement). She's forever holding it in her hand--not unlike a 16-year old girl! My wife took her leather iPod cover to a local shoe maker, and had wrist strap put on it. It is one of those large ones that are easy to drop. She has not dropped it since. THAT'S interesting. My wife even talked about "why don't they have wrist straps?" after she broke her 2nd screen. To me, that would just be a major PITA. Mike - Would something like this work? I'm in no way associated with or endorsing the above but it does seem to fit the bill. I'll be sure to show that to her tonight! Again, I think it would be nothing but a PITA. But everybody's different! Hey Clint! Showed her last night and she is 100% on board. All she can say is that "if I'd had one of those before, we'd have saved $200!" In fact, when she was one of the many images on the site which displays the product, she said, "that's just how I hold the phone when it slips out of my hand!" If I don't find something cheaper, I might be ordering one of those very straps from that page. Tomorrow IS her birthday, after all!